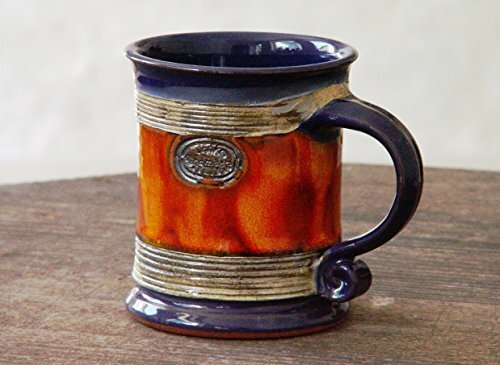 Our hand thrown stoneware pottery coffee mugs have an amazing smooth feel to it as well as having a good design. 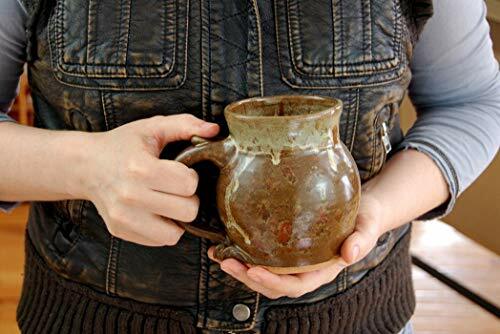 Each mug is carefully hand thrown and a handle pulled to fit your hand. The mug in our Red Agate glaze stands 4.5" and comfortably holds 16 oz. 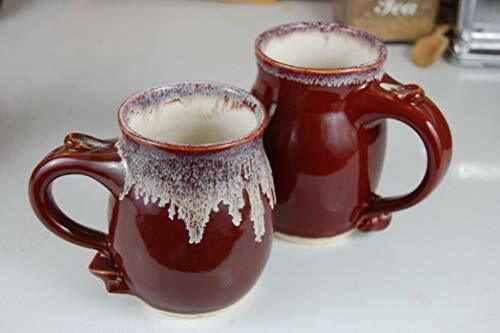 Our rich food safe Red Agate glaze makes these mugs pop. All of our stoneware pottery is fully functional for daily use, never contains lead and is food safe, as well as dishwasher and microwave safe. Everything here in our shop has been handmade by husband and wife potters JR and Kristen Page. Gift wrapping is available upon request for a small fee. 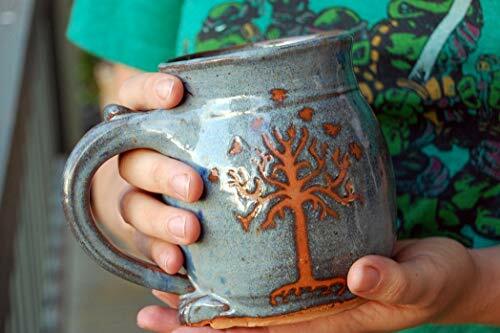 This wheel thrown slate blue handmade pottery mug has the tree of life or Tree of Gondor on it. The tree of life alludes to the interconnection of all life on our planet and is a common motif in various world theologies, mythologies, and philosophies. 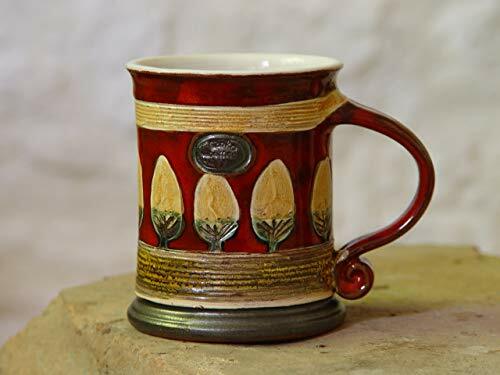 Used in the Lord of the Rings as the Tree of Gondor Our mugs have an amazing feel to it as well as having a good design. The rust colored tree of life design reveals the raw clay it is created from. Carefully crafted to fit your hand, this 4.5" mug comfortably holds 16 oz. The mug in the photos has sold, and with all handmade pottery slight variation will occur, making each unique. All of our stoneware pottery is fully functional, food safe, (never contains lead) and is dishwasher and microwave safe. Everything here in our shop has been handmade by husband and wife potters JR and Kristen Page in Burnsville North Carolina. Gift wrapping is available upon request for a small fee. Made to Order - May take 30 days to complete. 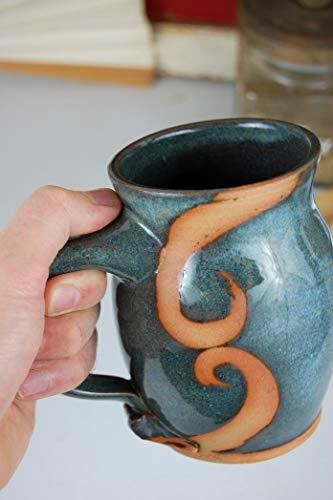 This handmade pottery coffee mug has an amazing smooth feel to it as well as having a good design. Carefully crafted to fit your hand, this 4.5" mug comfortably holds 16 oz. After being hand thrown on the pottery wheel a handle is pulled on each mug and a thumb rest is placed for both comfort and grip. Our rustic Brownstone glaze has wonderful earth tones and rich depth of color perfect for your new coffee mug. Each of our handmade pottery mugs are as unique as you are, which is the nature of all things handmade. All of our stoneware pottery is fully functional for daily use, and never contains lead, as well as dishwasher and microwave safe. Everything here in our shop has been handmade by husband and wife potters JR and Kristen Page. Gift wrapping is available upon request for a small fee. Wheel thrown and hand painted ceramic mug for tea or coffee. Unique gift for any occasion. Available in two sizes - 10 oz., and 15 oz. Food safe, microwave safe, dishwasher safe. Matching sugar bowl available. Standard shipping to the USA usually takes 8-15 business days. Expedited shipping available (6 business days). Wheel thrown, hand glazed ceramic mug. Perfect gift for kids. Available in two sizes: *Capacity: 200ml/6.7oz. Approximate measuring 3.9in/10cm wide by 4.7in/12cm high. **Capacity: 380ml/13oz. Approximate measuring 4.2in/11cm wide by 5.2in/13.5cm high. Food safe, microwave safe, dishwasher safe. The listing is for one mug. Standard shipping to the USA usually takes 8-15 business days. Expedited shipping available (6 business days). 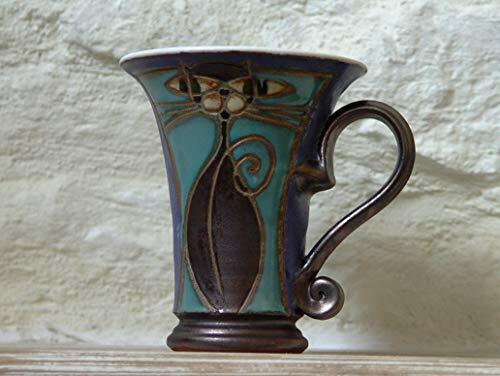 HANDMADE: Made on a potters wheel by hand in the Castle Arch Studio workshop in Kilkenny Ireland. Each coffee mug is individually inspected for quality of color and finish before leaving the studio for loving homes around the world DURABLE: These mugs are designed to be enjoyed and used on a regular basis. 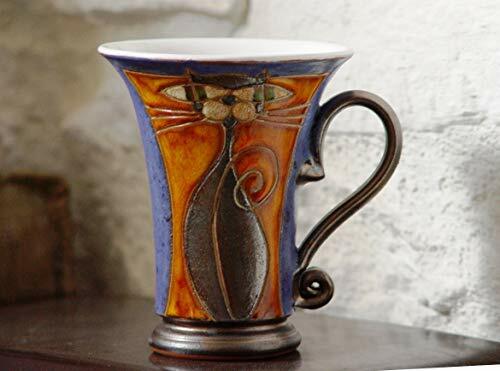 They are hand-glazed in a high temperature two stage firing to bring out the stunning colors and make the mugs robust for everyday use. Safe to use in dishwasher and microwave, do not use in oven. Dishwasher and Microwave safe. 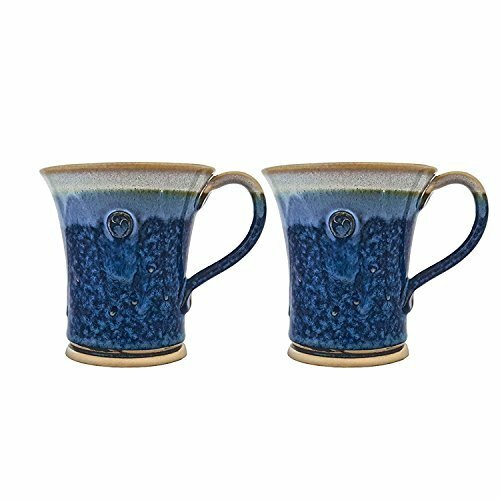 UNIQUE DESIGN: These coffee mugs are an original design by the Master Potter in the Castle Arch Studio, perfect for wrapping your hands around. Each mug has a beautiful and simple Celtic Spiral logo on the outside which look great with the overall design of the pieces. Beautiful Hues of Blue and Golden brown with a contrasting border. Set of Two Mugs. Wheel thrown, hand glazed ceramic mug. Perfect gift for any occasion. Available in two sizes: *** Capacity - 300ml/10oz. *** Capacity - 450ml/15 oz. (not filled to the rim). Dishwasher, microwave, food safe. The listing is for one mug. Standard shipping to the USA usually takes 8-15 business days. Expedited shipping available (6 business days). Wheel thrown, hand glazed ceramic mug. Perfect gift for kids. Blue, orange, and yellow colors. Available in two sizes: *Capacity: 200ml/6.7oz. Approximate measuring 3.9in/10cm wide by 4.7in/12cm high. **Capacity: 380ml/13oz. Approximate measuring 4.2in/11cm wide by 5.2in/13.5cm high. Food safe, microwave safe, dishwasher safe. The listing is for one mug. Standard shipping to the USA usually takes 8-15 business days. Expedited shipping available (6 business days). Shopping Results for "Hand Thrown Pottery Mugs"